Sideline Views: Odds Are. . . I wrote a feature piece on Omar Gonzalez last week for Futbol Mundial. It'll be out soon, but one thing Omar mentioned made be think of Oguchi Onyewu. Omar was talking about finally making it on to the U.S. national team, and how important that was. He alluded to how that would affect his future club decisions. Omar specifically said that he had heard from Jurgen Klinsmann that national team selection would focus on players who were game-fit and battle tested. Translated: If you want to try your luck in Europe, go for it, but don't feel hard done by if you wind up on the bench and I don't take you to the World Cup. Not long ago, Gooch was pointed to as the player who had done things the hard way - the right way - no Major League Soccer experience, straight to Europe, playing for bigger and bigger clubs. But then the soccer equivalent of the Peter Principle kicked in and he languished on the bench in Europe. Granted, he was also injured. 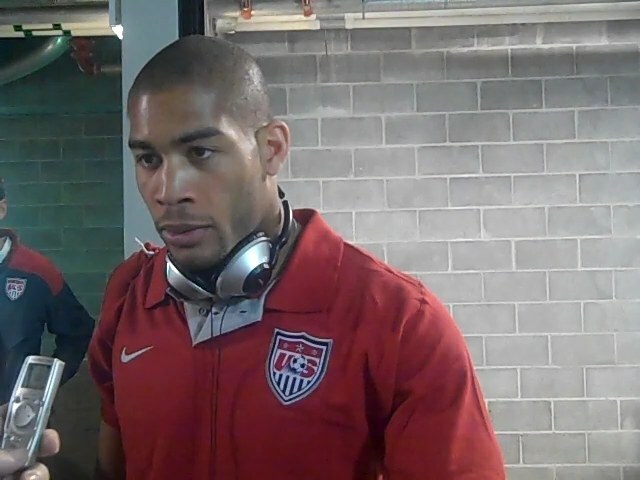 At this point, though, Onyewu isn't on the USA roster. What odds would you give for his return? By the way, I'm not saying that playing in MLS would save Onyewu's international career or anything like that. That didn't work for Jovan Kirovski, for example.